Kevin Ryan was born and raised on the western part of O‘ahu in our second city, Kapolei. 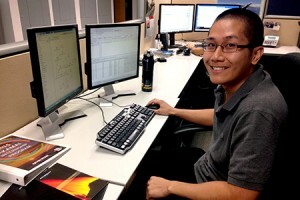 He is a Honolulu Community College student completing an Associate of Science degree in the Computing Electronics Networking Technologies (CENT) program. Kevin’s expected graduation is in the fall of 2015. He will be transferring to the University of Hawai‘i – West O‘ahu to double major in CENT and Information Security Assurance (ISA), also known as Cyber Security. After completing his degrees, Kevin plans to pursue a career revolving around Network Engineering and Security. When he is not studying for his next certification, Kevin enjoys spending quality time with friends and family, lifting heavy weights, driving fast cars, and eating delicious foods. Project Abstract: As we enter the “Big Data Era”, professionals are relying on business intelligence tools and data management to quickly analyze high volumes of semi-structured data in order to make better business decisions. Akimeka is a software development firm that maintains systems for the Department of Defense (DoD) and enhances the software per requirements defined by the DoD. Akimeka expects to better serve its clients’ needs by migrating from storing and managing requirements in MS Word Documents and MS Excel Spreadsheets to a Requirements Management System. Akimeka’s new system aims to improve accessibility and analysis of functional, system, and design requirements for its stakeholders. The Requirements Management System needs to transform data from Excel spreadsheets to a database environment to improve requirements analysis, accuracy, and search capability for the Akimeka team. This project’s effort was to research and design two possible solutions for data migration, conduct an analysis of alternatives, make a recommendation, and to implement, test, and document the chosen solution. The two possible solutions were writing Custom Java Code or using Pentaho’s Data Integration (Kettle) software to provide Extract, Transform, and Loading (ETL) of the data into an Oracle database. Based upon research of both approaches, Pentaho’s Data Integration (Kettle) is recommended because of its scalability, data change adaptability, and overall ease of use. Currently, the ETL design has been implemented, tested, and properly documented. It affords Akimeka’s management the capabilities to ingest large amounts of data from multiple spreadsheets, transforms the semi-structured data into an accurate searchable structure, and loads the data into an Oracle database for business analytics. With the new Requirements Management System in place, Akimeka will more effectively and efficiently meet the government’s requirements for these systems and ultimately enhance software services for military members and their families.